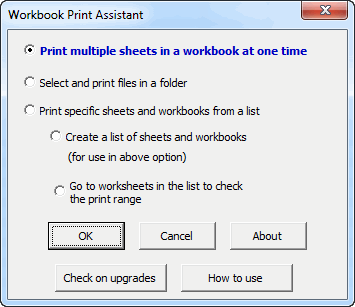 The Workbook Print Assistant add-in for Microsoft Excel will quickly and easily print all the worksheets in multiple workbooks at one time. Or you can use it to selectively print worksheets in many different workbooks. Workbooks will be opened and closed as needed. It is compatible with Microsoft Excel 2007 to 2019 and Office 365. Theresa Sholl wrote: "I apologize for the late response. I re-downloaded the Workbook Print Assistant and tested it. It seems to be working just fine. I appreciate your quick response to my specific printing needs (we had added a feature for Theresa). You don't know how much time this add-in will save me and my staff. You just may be my new best friend." Just select the option you want to do all your printing quickly and easily. CSV File Creator - Create CSV files the easy way, without warning messages.